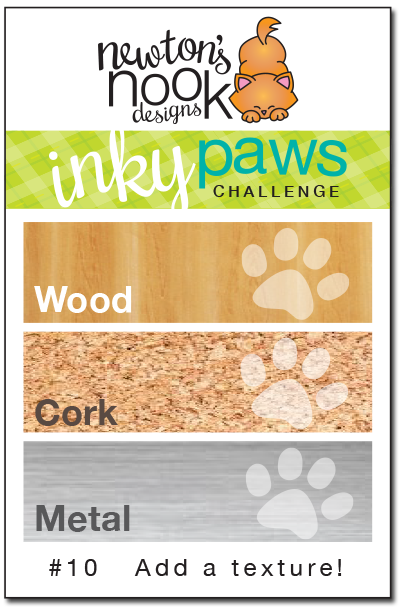 Newton's Nook Designs: Inky Paws Challenge #10 - Wood, Cork, Metal! Happy Friday and the the first day of #10 Inky Paws Challenge! This month's challenge is a Texture Challenge! 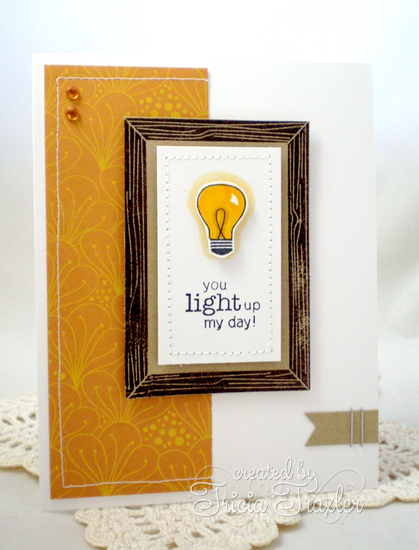 For this challenge you can choose to add Wood, Cork or Metal to your card - or go nuts and do all three! The choice is yours! We thought this would be fun as you're probably preparing Father's Day cards right now too! You have two weeks to play along. Deadline to enter is Friday, June 6th, 2014 at Midnight CST. The winners will be announced on the NND blog on Monday, June 9th. Post your project to your blog or to an online photo gallery such as Flickr or splitcoaststampers (on splitcoast please use keywords newtonsnook and IPC10). Tricia Traxler (May Guesst Designers) used two textures on this cute card - a stamped wood frame plus Metal staples and brads! She used the lightbulb stamp from Around the House set - so much fun! Samantha used wood as a background on her card! 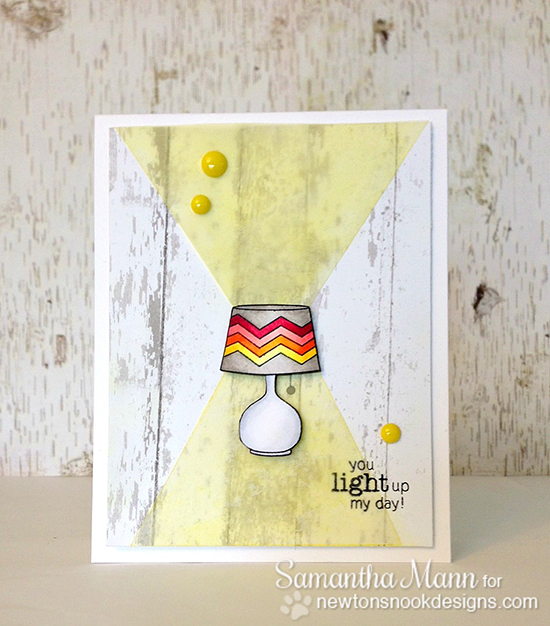 She featured the lamp from the Around the House and added some fun yellow vellum to look like the light shining out! Love This! 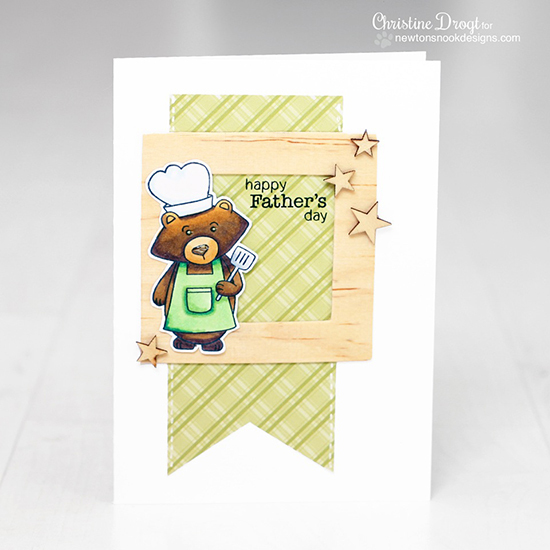 Christine used the cute bear from our Winston's BBQ set. She added him onto this card with a fun wood frame and wood stars! So perfect for Father's Day! 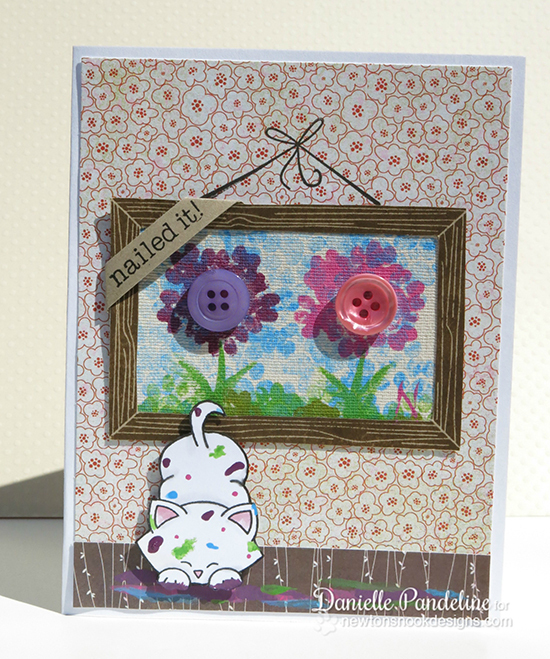 Danielle used a wood frame on her card from our Around the House set. Inside the frame is some fun canvas, made to look as if it's stamped by Newton from Newton's Antics! Isn't that fun? He literally has Inky Paws!!! 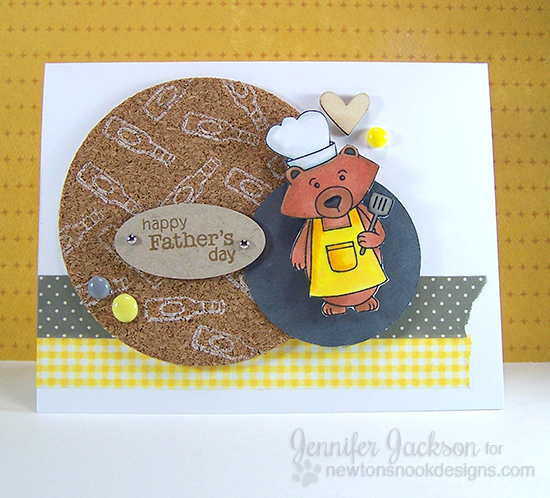 Tessa used a wood embossing folder to create her card base and a wood thought bubble too! 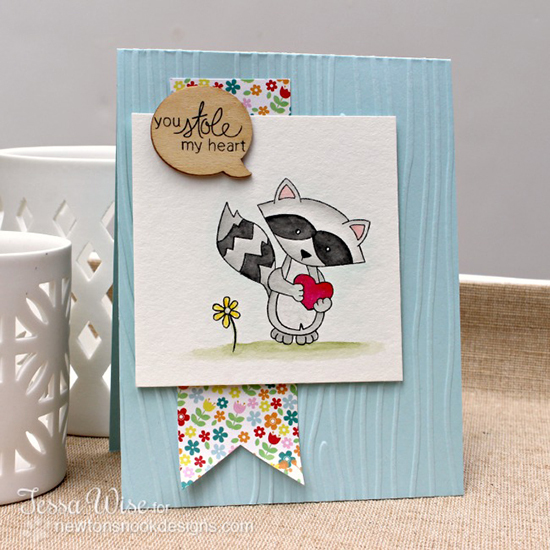 She used that cute little bandit from the Sweetheart Tails stamp set! This card is so simple and sweet! Larissa used a fun piece of wood and paper pierced the fun tape dispenser from the Around the House set. She also added some metal tape and metal toned sequins! Love that bit of Metallic!! And one by Me - I managed to get in all 3 textures. I used used a big circle of Cork and stamped beer bottles on it with White ink. Then I added metal brads and a wood heart too! as a background on her card! The bear is from our new Winston's BBQ set! I love how fun this set is for Father's Day! Now this is post filled with inspiration! Wow!!! Love all of these cards!! And Jennifer your card ROCKS!! Love the cork! Eek! So fun!! Such wonderful projects, Team!! I love every single one! and mostly I use the 3G Router, aas it provides better connection, fast and stable. Most hackers follow strong rules of behavioir in internet. are at a considerable risk. What an amazing challenge you've invited us to play with! The DT cards are fabulous! WOW! !